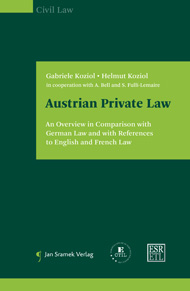 This book gives an introduction to Austrian private law from a comparative law perspective. Based on the ideas of the Age of Enlightenment, the Austrian General Civil Code differs to quite some extent from the German Civil Code, which is one hundred years younger and the child of Pandectism. To make differences and similarities clearer, the book therefore introduces Austrian private law in comparison to the much more well-known German law. Furthermore, comparative remarks on English and French law, as two of the other most important European legal systems, as well as on Chinese and Japanese law are included to make the characteristic features of Austrian law clearer and to put it in broader context.